The new tariffs the White House announced last month are likely to make things worse for the industry. Solar installation jobs made up the vast majority of employment in the industry. In April, Suniva, a Georgia-based manufacturer owned by a Chinese company, filed a complaint with the US International Trade Commission after declaring bankruptcy, arguing that it was impossible to compete with imported prices. In May, SolarWorld, the Oregon-based subsidiary of a German panel marker, joined the complaint. The companies requested that the Trump administration impose tariffs on panels under the 1974 Trade Act that would more than double the price of solar cells from about 33 cents to more than 78 cents per watt. Roughly half of all solar equipment used in the US this year is expected to come from overseas. The new fees are forecast to send solar installations plummeting by 11 percent over the next five years, according to GTM Research, a renewable energy market data firm. Bloomberg New Energy Finance projected solar deployments to drop by 5 percent over seven years, owing to a predicted uptick in construction after the four-year tariff expires. 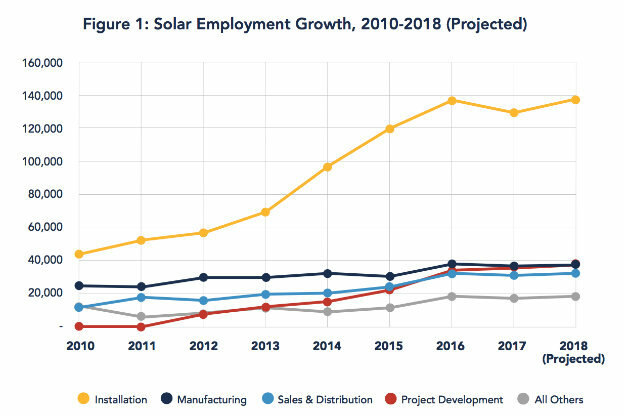 But the previous rate of job growth is unlikely bounce back, as solar companies seek new ways to cut costs as panel prices rise. The Solar Foundation conducted its survey of 2,389 solar businesses―some of which included various outposts of the same company―in October and November, using the Bureau of Labor Statistics’ methodology to make 59,300 phone calls and send 35,000 emails. At this point, the White House’s impending decision on the trade case hung over the industry, and the survey responses reflect the uncertainty over the ruling, Gilliland said. In July, mayors from 1,481 cities representing 148 million people and 41.8 percent of electricity use across the US signed a pledge to go 100 percent renewable by 2035. California vowed to get 50 percent of its electricity from renewables by 2030, and could now hit that target a decade early. New York set the same goal, and New York City Mayor Bill de Blasio announced plans last month to divest a $5 billion stake in fossil fuels from the city’s five pension funds and sue oil companies for damages related to sea-level rise. 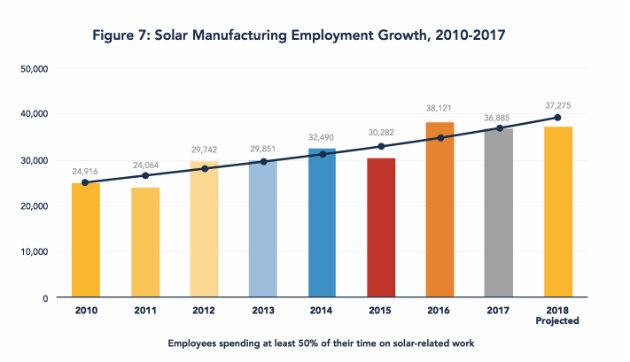 The rising tide pulled by cheap, imported solar panels buoyed manufacturing jobs in the US, too, as employment peaked in 2016 abreast of the installation sector. But solar manufacturers warned that the Trump administration’s tariffs could hurt hiring at their factories. The majority of Americans understand global warming is happening, and that humans are causing it, though partisan divides remain stark over how to address greenhouse gas emissions. Solar energy nonetheless enjoys sweeping support, with nine out of 10 US adults in favor of expanding its use, according to a 2016 Pew Research Center poll. Solar capacity around the world is still on track to multiply 14 times over by 2040, a Bloomberg New Energy Finance study found last year. Solar Geoengineering Could Prevent Massive Storms. It Could Also Backfire.